Xmas and CNY is only 1mth apart! .. I was contemplating not baking anything for CNY since i baked for Xmas already. But I know there are some recipes that are not so difficult lah. 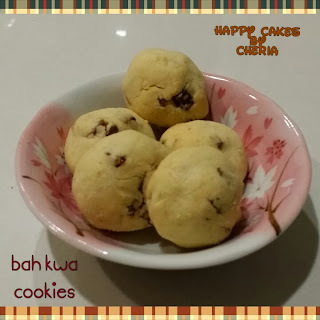 So I decided to try out something Savoury for CNY this year as too much Sweets stuff around usually... A search online and i found this not so difficult recipe from Anncoo Journal - Bah Kwa Cookies. Was worried that the cookies gonna taste weird as its still a sweet batter and now Bah Kwa will be added. Anyway, the end result is really GOOD! !